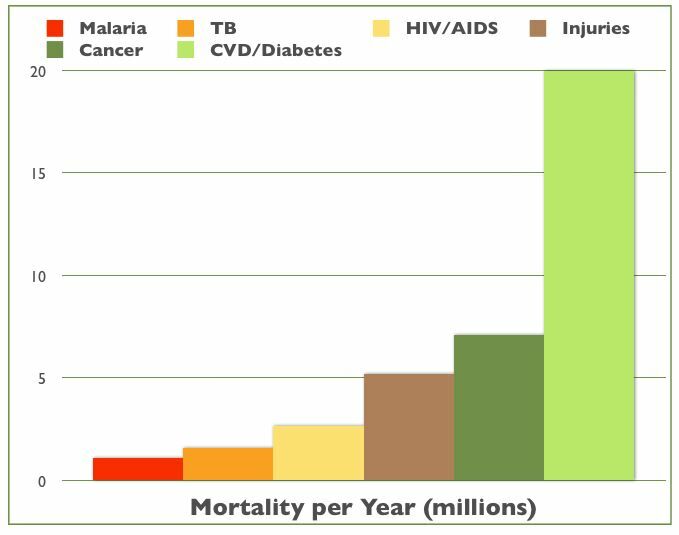 The WHO estimates that atherosclerosis (heart attacks and strokes) and diabetes (95% of the Type 2 variety) kill about 20 million people every year, more than are killed by war, famine, AIDS, tuberculosis and malaria combined, and more than might conceivably be killed in a single pandemic of bird flu. Bill Gates gives billions to trying to eliminate infectious disease but never mentions the really big killer, cardiovascular diseease (CVD) in the form of atherosclerosis and hypertension (high blood pressure). Half of cardiovascular disease deaths occur in people under 70 years old and at least 90% are preventable with simple lifestyle changes. So, if they are preventable, why aren’t they being prevented, like small pox, the plague and polio? Diseases of lifestyle (coronary heart disease, strokes, type 2 diabetes, hypertension, obesity) are fundamentally different from communicable diseases. They are determined by each individual’s choice in nutrition, exercise and tobacco use. When people are deluded into the belief that they can avoid changing cherished habits by partaking of expensive drugs and procedures, these diseases become rampant. A typical "high risk" person. No amount of drugs, tests or operations will save him from his addictions. The ancient Greeks were very perceptive. They gave their god of medicine, Asclepius, two daughters, Panaceia, the goddess of the expensive quick fix, the treatment of symptoms, not the disease and Hygeia, the goddess of cost-free prevention and treatment of disease by healthy lifestyle. We have developed this site to prove to you that lifestyle change, Hygeia, is the only way to prevent and treat these diseases. Drugs and procedures, Panaceia, only treat symptoms and will not decrease total mortality. Panaceia is founded upon a number of medical myths promoted by those selling a particular panaceia. Generally these myths play upon fear of death and have some variant of “unless you do this, you will die.” There is increasing evidence that Panaceia will actually kill more people than it could possibly save. 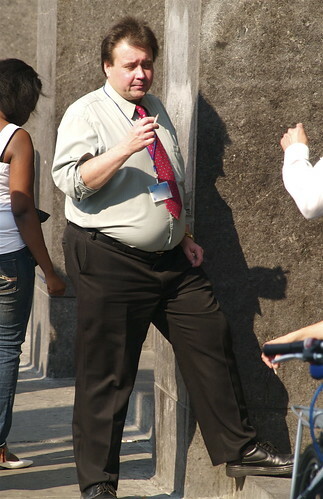 In particular, the current obsession with “cholesterol”, beginning in the early 1980s with the monstrous mistake in the planning of the Lipid Research Clinics Coronary Primary Prevention Trial, has led doctors to largely ignore the larger environmental determinants of morbidity and mortality and inadvertently encourage the pandemic of obesity and diabetes. The recent ASTEROID trial is a classic example. See our photo essay on Food Addiction. If you have any comments on the ideas presented here please EMAIL us. Financial Disclosure: This site is solely for the purpose of education and is financed by us as a community service. It is not intended to replace the advice of your doctor, just to give you some questions to ask him or her. The authors receive no income from this site. Any money collected for recommendation of books, etc. will be donated to the Library of McGill University. If you like this site and want your health or disease care professional to have unrestricted access to unbiased information, the foundation of health, we encourage you to donate to your nearest university library or to McGill’s. Is it actually Colin Rose posting in the comments of this article, or a troll stirring up trouble under his name? Yes, that’s me. Stirring up trouble? I would think Zamboni is the one doing the stirring. Nothing riles me more than a surgeon flogging a totally unproven procedure as the cure for a disease. After 30+ years in practice I have seen this phenomenon far too often. If I can stop one more of these before $billions are spent on it I will feel I have partly repaid my deb to society for the privilege of being a doctor. I can’t believe you are throwing MS into your “lifestyle” disease bucket. It must be so great being perfect. No problems with overeating for emotional or spiritual reasons, no crutches like junk food or alcohol or caffeine. And, yet, even though you seem to be perfect and you have no flaw, you still show such compassion by posting pictures of overweight people on your blog and basically making fun of them. I made clear in my first post on the Zamboni fantasy that I was using this story as an example of a medical myth that had nothing to do with lifestyle. I have never “made fun of” obese people. They deserve as much compassion as any drug addict. Junk food addiction is just more obvious. One would think that an addiction that couldn’t be easily hidden would be better controlled. Addictions of all sorts are the main causes of most of the problems of secular capialist democracies. Every minute of our non-sleeping existence each of us is faced with making a choice from an almost infinite variety. Some people choose to destroy themselves for instant gratification. How we can train people to control these impulses must be a major goal of our educational systems. Our blog is a small attempt at such education. Can you show me the double-blinded study that completely rules out the correlation between CCSVI and MS? I don’t seem to be able to find it. There are now half a dozen such studies. See my blog for one of them. This is a flawed study. How can a neurology dept alone hope to understand the finer detail without working with vascular experts. I await with interest the studies where multi-discipinary teams actually work together. The Kuwait study has been jeopardised by a neurologist fraudulently publishing results. Unless these people begin to work together without personal bias colouring their views, this debate will continue to rage. I’m a little confused as to why Colin Rose has chosen this “cause” to act as a spokesperson for when the majority of this blog is about the health problems associated with bad diet and smoking. Why isn’t he taking this hard line against the fraudulent doctors who aid and abet food production companies to lace our foods with hidden processed sugars. Surely instead of aiming his criticism at victims of these awful crimes ie people with weight problems, he would be better campaining to stop the adulterating of our foods. It would also seem better fitting to his skill set as cardiologist. Not trained in the protocol for ccsvi. Please read the paper carefully. The methods describe following Zamboni’s protocol. Is there something else you think should have been measured? Reflux in the internal jugular veins (IJVs) and/or vertebral veins (VVs) in the supine and sitting position. Flow characteristics of both IJVs and VVs were investigated in 0° supine followed by 90° upright sitting positions. Reflux in any vein >0.88 s was considered ‘pathological.’ Data were recorded during a period of 3–5 s of apnoea following normal exhalation. The probe was located in a longitudinal plane between vertebrae C6 and C7, which was maintained when participants changed to upright position. ¶This Zamboni criterion was modified. Given that negative values for ΔVCSA in the IJV represent not a pathological but a physiological state, this criterion was substituted by ‘atypical flow,’ /, indicates p value could not be calculated. indicating a positive value of ΔVCSA. Further to last post: You can’t state you followed the protocol on one hand and then state that the protocol wasn’t clear so you modified it! Ridiculous!! Ridiculous is right! The problem is that Zamboni has never been able to write down in clear language exactly what he does, a basic criteria for doing science. But all well-blinded studies attempting to reproduce his technique have failed to find any difference in head and neck venous anatomy or flow between MS patients and normals. Zamboni insists that anyone wanting to diagnose “CCSVI” has to buy his machine and pay for a course he gives in Italy. This is not the behaviour of a real scientist. Zamboni has never done a properly blinded trial of neck vein imaging, can`t even coherently describe what he does and refuses to take part in collaborative trials, insisting that only he can really diagnose “CCSVI”. So why would anyone pay any attention to his junk science in the first place? It appears that Zamboni has a secret for diagnosing “CCSVI”. He knows before doing the test if the patient has MS or not and tailors his test results to fit the patient`s condition. This behaviour is called charlatanry. This study was CLEARLY an attempt by neurologists to disprove the theory NOT investigate it without bias. The Kuwait study was jeopardised by a neurologist publishing bogus results. There are studies currently in operation that are truly collaborative and include experts from multidiscipinary teams. Incidentally, one of those is in Italy. Surely the better way to solve this once and for all is to allow those studies to be done in a true and proper manner for the benefit of people with MS and not for the self-interest of the medical community. Exactly why would any neurologist not want to find a cure for MS? Any neurologist I know would love to. They see the suffering every day. And exactly how would not finding a cure for MS benefit neurologists? They have lots to do without treating chronic MS and whatever they get paid for the time they spend treating chronic MS is certainly not worth it but they do it because they are professionals. But in medicine we know from long experience that any proposed treatment must be tested rigorously in properly blinded trials that adequately eliminate the placebo effect. None of the ongoing trials of “liberation” of which I am aware are properly blinded or have objective endpoints. Zamboni has refused to participate in the collaborative Italian trial because he insisted on doing the neck ultrasound studies himself. Self interest? The Zamboni cult will never be satisfied with any study because they have a religious faith in “CCSVI” and will always find some rationalization or conspiracy theory to explain why the results didn’t prove its existence. If you want to talk money here’s an interesting comparison. The average neurologist might make $200,000 per year before expenses and the average pharmaceutical executive not much more. On the other hand the average charlatan doing “liberation” makes at least $200,000 per week with probably less than 10% of it needed for expenses. The immune response modifying drugs currently used for MS have been proven in blinded trials to reduce plaque progression. They do not reduce symptoms because, unlike unblinded trials of “liberation”, the placebo effect was eliminated by careful blinding. Powerful drugs will have side effects in some people. In comparison “liberation” has never been proven to have any effect on disease progression, so any side effects it might have are unacceptable. No one ever said the autoimmunity was the primary cause of MS, just that the immune response was involved in the progression of the disease. The primary cause remains unknown. I and any other doctor who paid any attention in medical school is in a position to state categorically the “CCSVI” is junk science. I have outlined the scientific reasons for rejecting the “CCSVI” hypothesis a priori in my blog. Please reply to each specific point in that blog and state why I am wrong. I think I’d rather wait until all the studies are done with and I think you should do the same. I think that the appropriate well-blinded studies have been done and they show that “CCSVI” doesn’t exist as a disease. If you don’t want to accept the well-blinded data to date could you suggest the design of a study the results of which you would accept? Would you accept the results of any study that disproved the Zamboni hypothesis? Absolutely I would. Interesting that you made up your mind in 2009. Before any of these studies.. Just your own hypothesis. I prefer to keep mine open until the multi-disciplinary, blinded studies are complete. BTW, I think you’ll find the latest studies show that the disease modifying drugs currently used have been shown to have little or no effect on disease progression. But you as a “cardiologist” probably know more than the neurologist I spoke with last week. As I said before, “CCSVI” is disprovable simply on the basis of known anatomy and physiology. You have made no response to counter these arguments, so I assume you agree. I don’t know what your neurologist is reading but here is a recent paper in the NEJM. “Liberation” has never been shown to have any such effects in a well-blinded trial which I highly doubt will ever get done. Two proof-of-concept clinical trials have provided evidence that laquinimod reduces disease activity in patients with relapsing–remitting multiple sclerosis. We conducted a randomized, double-blind, phase 3 study at 139 sites in 24 countries. lesions and new or enlarging lesions on T -weighted magnetic resonance imaging. Treatment with laquinimod as compared with placebo was associated with a modest reduction in the mean (±SE) annualized relapse rate (0.30±0.02 vs. 0.39±0.03, P=0.002) and with a reduction in the risk of confirmed disability progression (11.1% vs. 15.7%; hazard ratio, 0.64; 95% confidence interval, 0.45 to 0.91; P=0.01). The mean cumulative numbers of gadolinium-enhancing lesions and new or enlarging lesions on T2-weighted images were lower for patients receiving laquinimod than for those receiving placebo (1.33±0.14 vs. 2.12±0.22 and 5.03±0.08 vs. 7.14±0.07, respectively; P<0.001 for both comparisons). Transient elevations in alanine aminotransferase levels to greater than three times the upper limit of the normal range were observed in 24 patients receiving laquinimod (5%) and 8 receiving placebo (2%). can you please help me getting informations about the rights of use for the grafik https://medicalmyths.wordpress.com/atherosclerosis/. ?